This classic dessert was named in honor of the opera singer Dame Nellie Melba. It was invented by Auguste Escoffier, who was known as “the Emperor of chefs”. A half of a peach, with a scoop of vanilla soy “ice cream”. Raspberry sauce drizzled over. Topped with a dollop of whipped soy cream and a few almond slivers. Thaw the frozen raspberries, or clean and remove the stem of the fresh raspberries. Place the raspberries in a small sauce pan with 1/4 cup water and 1-2 tablespoons of sugar and a splash of lemon. Cook the raspberries until they become a syrup. Pour the raspberry syrup through a strainer to remove the seeds. Return the sieved raspberry syrup to the sauce pan. Dissolve the corn starch in a tablespoon of the peach syrup and add to the raspberry syrup. Cook until the syrup becomes thick. Put in the refrigerator to cool until served. Either make the whipped soy cream using 100 grams soy whipping cream and §-2 tablespoons of powdered sugar, or buy a can of Soyatoo whipping cream. 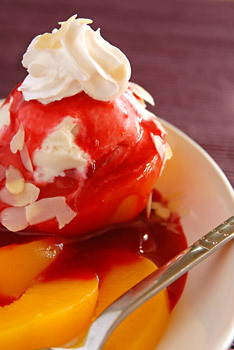 Place 1/2 of a peach on each desert plate or in a small bowl. Top with an ice cream scoop of soy ice cream. Pour or drizzle a tablespoon or 2 of the raspberry sauce over the top. 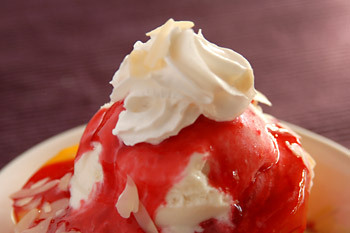 Put a dollop of whipped soy cream over the raspberry syrup and garnish with a few almond slivers. The original uses fresh peaches which you peel, cook in a sugar syrup, slice in half and cool. Posted by harald on May 15, 2007 in Desserts and Sweets, Ingredients, Meals, Peach, Raspberries, Soy Ice Cream.